Hunan [湖南] is a mountainous province located in the south of the middle reaches of the Yangtze River in southern China and was the early home of Communist leader Mao Zedong. The village of Shaoshan, where Mao was born in 1893, welcomes visitors to his mud-brick childhood house and the Mao Zedong Memorial Museum. In northwestern Hunan, the Wulingyuan Scenic Area is distinguished by thousands of quartzite sandstone columns. An astonishing landscape of rough, isolated mountain ranges, forests, lush rice terraces, waterfalls and karst peaks, among which the highlight is likely to be Wulingyuan Scenic and Historic Interest Area of Zhangjiajie. Scattered amidst the natural beauty are welcoming villages, ‘wind-and-rain’ bridges, Taoist temples and the ancient riverside towns of Phoenix and Hongjiang. In 1982, China established its first national forest park, Zhangjiajie National Forest Park was established in a particularly scenic area in northwest Hunan. The park is especially known for its quartz-sandstone rock formations, bare stone sculpted by nature and set among green trees and frequent clouds. The high and steep Mt. Hengshan is frequently snow-capped in the winter, contrasting with the subtropical fields that one sees below it. It is one of the five most famous mountains in the country. 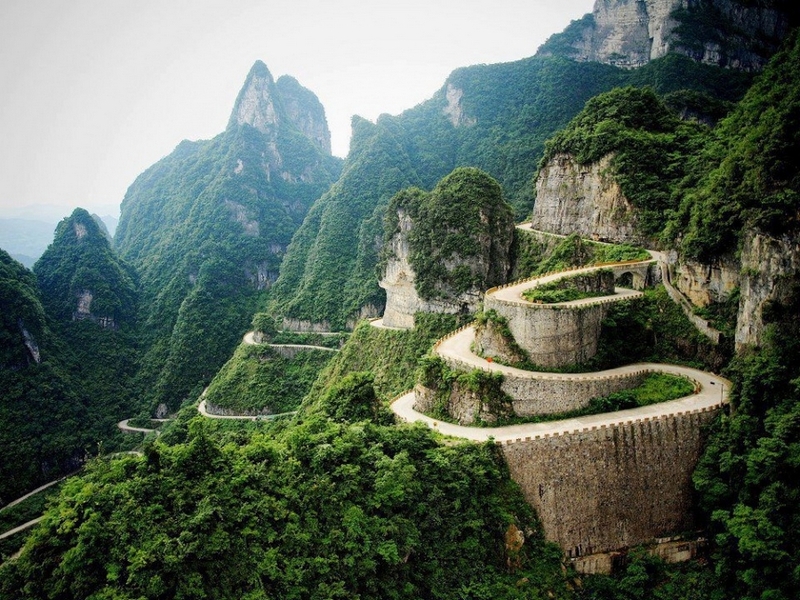 Known for its precarious cliffs, it is a holy mountain for both Taoists and Buddhists. Dongting Lake is the second largest lake in China. Yueyang City, located on the shore of Dongting Lake, is home to one of the country’s three famous towers. This is the Yueyang Pavilion which was originally built during the Tang Dynasty (618-907). The present pavilion is of recent reconstruction, built in the style of the Song Dynasty (960-1279). The region along the Yuanjiang River is especially well known for its serene beauty. It takes its name, the Peach Blossom Fountainhead, from a work of Chinese literature from the Jin Dynasty (265-420). Tao Yuanming wrote about an isolated Utopia like paradise where generations of people had escaped from the difficulties that others had experienced. The Yuanjiang River region has been a travel destination since ancient times. Historic Changsha, one of China’s famous cultural centres, is the capital of Hunan province. It is also a tourism centre, offering its visitors many historical sites and other places of interest. Other sites of interest in the region include – Mt. Hengshan, Tianxin Pavilion Park, Yuelu Mountain Scenic Zone, Fenghuang Ancient City and Phoenix Town. With abundant natural resources, the province covers 210,000 square kilometres (81,000 square miles). It is adjacent to Jiangxi Province in the east, Chongqing Municipality and Guizhou Province in the west, Guangdong Province and Guangxi Autonomous Region in the south, and Hubei Province in the north. The province has a total population of 64,400,700. It is multiethnic, with Miao, Dong, and Yao being the most numerous minorities. Their unique cultures and ethnic customs attract numerous visitors. Hunan’s cuisine has its unique flavour. Here, nearly every dish tastes hot and delicious. The local people like eating peppery foods. Local products include Xiang embroidery, one of China’s four famous embroideries. It has high artistic value. With 200 years of history behind them, the chrysanthemum stone carvings of Liuyang are vivid and exquisite. Liuyang City is known for its firecrackers, which are popular all over the country. Hunan enjoys a well-developed transportation network. Hunan has two international airports (Changsha Huanghua and Zhangjiajie Hehua) and three domestic airports (Changde Taohuayuan, Yongzhou Lingling and Huaihua Zhijiang). Most Chinese cities can be reached with a 2-hour flight. At present, the airline networks in Hunan have extended services to 78 cities at home and abroad with 118 airlines. The road network in Hunan extends in all directions inside the province and links it with neighbouring provinces, with total mileage ranking the third in China. Motorways connect Changsha with 13 major cities which makes all major tourist attractions easily accessible. Centred on the Dongting Lake and including the Xiangjiang, Zijiang, Yuanjiang and Lishui trunk rivers, a complex water network connects to the Yangtze River in the north links up the whole province. Yueyang, Changsha, Xiangtan and Zhuzhou, etc. all linked using the important transfer stations of the Hunan waterway network.